Factors that one should consider when coming up with a picture arrangement include, furniture arrangement, height, and lighting. The furniture placement affects the picture frames and the pictures themselves. They should fit comfortably in with the surroundings and hang at eye level. This should be lower in seating areas such as a living or dining room and higher in standing areas, like a hall. Avoid lighting that shines directly into pictures, as it will reflect and create hot spots obscuring your view. 1. Cut out kraft paper templates of pictures you want to hang. 2. Arrange the templates on the wall until you find a desired pattern. 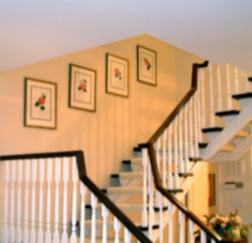 You may want to balance a larger picture against 2 or 3 smaller ones and keep spacing between pictures equal. 3. Hang pictures in the same order as the template design, using a level to check that they are straight. Tip: Hanging frames is quicker and easier to do with two people. Once you have determined the wall type and chosen a location for your frame you must determine whether it is to be hung using wire or hinge hangers. If there is no wire on the back of your frame DO NOT add wire as the hangers provided may not be designed for lateral stress. Using two hooks is a must for proper hanging of any frame larger than 12" in width. 2. Measure the width of the frame and find the centre point. that the wire is located. When hanging a frame with hinge hangers your measurements must be precise. Always measure twice before putting holes in the wall. them to ensure that they are secure.